JK Scheinberg worked as an engineer at Apple for 21 years. He has been widely credited for persuading Steve Jobs to switch Macs off of PowerPC to Intel. He retired in 2008. He was bored. Mr. Scheinberg decided to get a part-time job and he applied to work at Apple’s Genius Bar. 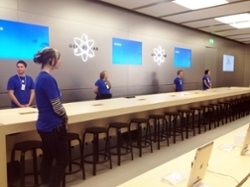 The Genius Bar is a service offered to Apple users who either need repairs or some help on using their products. Mr. Scheinberg, with his more than 20 years of software experience as an engineer at Apple, would certainly seem to be well qualified for the position. However, most Genius Bar employees are young.